RICHARD WILLIAM CORY was baptised in 1864, 31 Jan, at St. Andrew’s Church, Deal. He was the fourth child of Thomas William Cory & Elizabeth Ann May , Lower Street. In the 1871 Census, 7-year-old Richard was living in 7 Bulwark Row, Deal, with his parents and five siblings There were two sisters older than him and three younger brothers. His eldest sister was out at work. Richard was a scholar. Richard did not follow his father and two of his brothers as a boatman. Instead, he was apprenticed to a bricklayer. 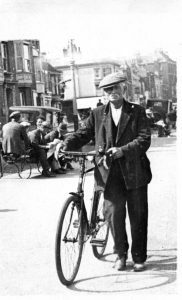 In 1881, at the age of 17, he was a bricklayer’s labourer, living at home at 78 High St, Deal, with his parents, his elder sister Mary and now four younger siblings. JANE BUSHELL BAKER was born 1st March 1862 at 19 Griffin Street, Deal. Her father was William Brett Baker, boatman, and her mother Sarah Elizabeth Baker, formerly Bushell, who registered the birth with her mark X.
Jane was baptised at St George’s, Deal, 23 May 1862. She was the third of four children. Jane’s mother died in the second quarter of 1869, when Jane was 7. In 1871 Jane, aged 9, was living at 159 Middle St, Deal, with her widowed father and 13-year-old brother William. It is not clear what had happened to her two sisters. Both children were at school. The Bakers were sharing the house with another family. In the 1881 census there is a Jane Bushell, aged 19 and unmarried, at the Napier Tavern, Beach Street, Deal. She is living with, and working for, her uncle William Bushell. William is both a boatman and a publican, a frequent combination in Deal. The ages of both fit perfectly with Jane Bushell Baker and her uncle William J. Bushell. The fact that Jane’s middle name was the same as her uncle’s surname may have confused the enumerator, who entered it as her surname too. Jane is an ‘Inn Ser Assistant’. In the next generation, some of her daughters worked as chambermaids and waitresses at the Beach Hotel. Given his addiction to alcohol, Richard may have met Jane through her work as a barmaid in her uncle’s pub. Richard Cory and Jane Baker were married in Deal in January 1887. 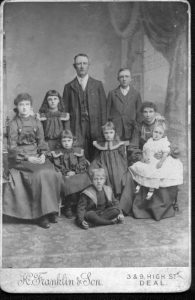 They started their married life in Littlebourne, just east of Canterbury, where their first two children were born, William Richard in 1887 and Jessie in 1888. Richard was soon in trouble with the courts after a display of bad temper. Whitstable Times and Herne Bay Herald. Saturday 15 September 1888. Richard Wm. Cory, a bricklayer, was summoned for assaulting Albert Brigland, on 3 September, at Littlebourne. Defendant pleaded not guilty. – Complainant, a carpenter, Bridge, deposed that on the afternoon of the day in question he was working at some cottages in Littlebourne. Defendant came and asked for a man named Sargeaunt. Witness said he had not seen him and defendant said it was an untruth and struck at him. Witness warded off the blow, and went on with his work and defendant struck him again. – Defendant in defence, said complainant had been finding fault with his work and he went to see Mr Sargeaunt about a post card he had received. Witness put his hands up in self-defence and they both fell to the ground. – Mr Sargeaunt, builder, said he had been having some houses built by sub-contract, some of the work had been scamped and he made complaints about it. Cory was annoyed at the complaints, and vented his spite evidently on the prosecutor. – Fined 5s and 9s costs. At the time of the 1891 census, they were back in Deal, where the family were visitors at the home of George and Sarah Norris, 96 Sandown Terrace, Deal. Sarah is Richard’s sister, formerly Sarah Sackett Cory. 1891 Census. Deal. 96 Sandown Terrace. The middle initial of Jane’s name should be B. Unfortunately the family cannot be found in the 1901 census. By then, four more children had been born. Richard Cory became a builder and decorator with his own firm. A street directory of 1898 has a Richard Corey living at 55 College Road, Deal. Richard and Jane would have been in their thirties then. Herbert George (Bert) was born in 1899. Edith Maud was born on 12 Dec 1901. The last child was Jane, born in 1905. Nine days later, on 3 October, her mother, Jane Bushell Cory, died. By this time the family had moved to 2 Cannon St, Deal. Jane died at home. The cause of Jane’s death was “Thrombosis Pulmonary Embolism”. This means that she developed a blood clot which travelled to her lungs. Deep vein thrombosis is a significant risk in the weeks after childbirth. Jane was attended at her death by her sister-in-law Mary Ann Norris Adams. Mary was the eldest of Richard’s siblings, five years older than him. She had married the boatman Francis Stay Adams. She gave her address on Jean’s death certificate as 99 Landown Road, Deal, and said she was present at the death. Richard’s occupation is given as “Bricklayer ‘Journeyman’ ”. Little Jane was always known as Jean. Jean Cory’s daughter, Rosemary, said: “When she died Aunt Jess took over the running of household and as Grandfather was a drinker she often had to go in the pub after him, and shame him into giving her the money to run the house on. Seated: Jess, Flo, Nell, Ethel, Jane with Edith. This was taken before Jean was born. In the last quarter of 1907 Richard married again. His second wife was a widow, Caroline Finnis. Her previous husband, William Finnis, was a painter and paperhanger. In the 1901 census they were living in Sandwich, but their older children were born in Deal. The two men may have worked together there. In 1901 Caroline had five children. Two more were born before her husband died. Caroline had at least two children by Richard. In the 1911 census the family were back in College Road, though a different house from that in 1898. The house must have been very crowded. There were seven children from Caroline’s first marriage, five of Richard and Jane’s children, and two boys from this second marriage. Their ages ranged from 21 to 1. Richard is listed as a bricklayer, not as a builder and decorator with his own firm. The 3 after Carrie’s name means that she had been married to Richard for 3 years. The marriage was not a success. Caroline left, taking with her the children of her first marriage and those she had had with Richard. To this day, there are descendants of the two branches of this family in Deal who meet in the street but do not speak. Jess took over the housekeeping again. Early in 1915 she married Edward Joseph Hopper. He and Richard lived next door to each other and went into business together. Richard drank the proceeds and the firm went downhill. For short while, the housekeeping fell to Flo, but she married Albert Ratcliffe a few months after Jess’s wedding. By now World War I had broken out and three of the family were directly involved. 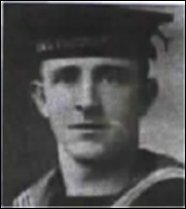 The eldest son William joined the Navy and was killed in an horrific accidental explosion on HMS Vanguard in July 1917. William Richard, the eldest son of Richard William and Jane Bushell Cory of Deal, After leaving the Central School William was employed by a builder until he joined the Navy in August 1906. He served on the Intrepid, Leviathan and Natal. He was on the Natal when she obtained the prize for the best gunnery in the Fleet. He had been on the Vanguard for about 4 years when toward the end of 1916 he was recommended for the commissioned rank of mate. Having specialised in torpedo work he preferred to put in for an appointment as torpedo instructor, for which he was hoping to qualify. who died on Monday, 9th July 1917. Age 29. Petty Officer CORY was the son of Richard William and Jane Bushell Cory, of Deal. CHATHAM NAVAL MEMORIAL, Kent. Panel Number 21. 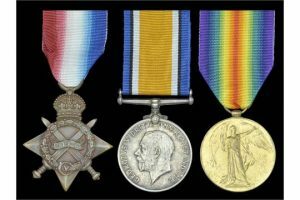 In 2015 William’s medals were up for auction. William Richard Cory was born in Canterbury, Kent on 8 March 1889. He entered the Royal Navy as a Boy 2nd Class on 31 July 1906 and was advanced to Boy 1st Class in October 1906. He was promoted to Ordinary Seaman in March 1907 when on Victorious; Able Seaman in March 1908 on Leviathan and Leading Seaman in August 1912 when on Intrepid. Cory was posted to the dreadnought battleship Vanguard in November 1913 and served aboard her at the battle of Jutland. He was killed aboard the same vessel when she blew up, due to an internal explosion, when lying at Scapa Flow on 9 July 1917. Out of a complement of 670, only one officer and two seamen were saved. Cory was the eldest son of Richard William Cory, of Fernside, Middle Deal Road. With copied service paper, newspaper obituary bearing his photograph and other research. Ethel Annie Cory joined the WAAC. The huge number of war casualties meant that the army was short of soldiers for non-combatant duties. The Women’s Auxiliary Army Corps was founded in July 1917. Ethel enlisted on 15 Oct 1917, when she was 19. In 1918 the corps was renamed Queen Mary’s Army Auxiliary Corps. On her medal card she is listed as a “worker”. This was the lowest rank. “Forewomen” were the equivalent of NCOs and officers were “Controllers”. Her soldier number was 9027. WAAC volunteers wore khaki uniforms, which included a small cap, khaki jacket and skirt. The skirt had to be no more than twelve inches from the ground. In this photograph, which is believed to be of Ethel, she has a white or light-coloured collar. This would seem to indicate that she had been promoted to the rank of forewoman, but this does not agree with the information on her medal card, issued after she was discharged. The fuller transcript of her medal card lists her rank as “Wheeler”. I have found no other reference to this rank, so it is probably a mistranscription. It is a pity that the photograph is not in colour. This would have enabled us to know what section she worked in. The coloured insets on their shoulder straps indicated a woman’s job: red for the Household section, brown for the Clerical section, purple for Mechanical and General (except motor drivers), and claret for Motor Drivers. Women in the WAAC exercised every day, taking part in Morris dancing and hockey to keep fit. Ethel was discharged on 15 Oct 1919 because she was medically unfit. On 2 March 1920 she was awarded the Silver War Badge. This was awarded to men and women who were honourably discharged during World War One due to illness or injury. 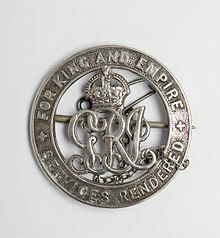 The small circular silver badge bears the initials of the King and a crown and is inscribed with the words ‘For King and Empire, Services Rendered’. In the third quarter of 1921, when she was 23, she had a son, Norman. Two years later, in the first quarter of 1923, still unmarried, she died of TB. In her final months she was pushed about the town in a basket wheelchair. Her son was brought up by her Aunt Minnie and her husband, who had no children of their own. The younger son, Herbert George, who was known as Bert, received a Campaign Medal. He served in the London Regiment. His soldier number was 699122. He was only 15 when the war broke out, so he must have enlisted quite late in the hostilities. He was gassed and was ill for the rest of his life. On 30 July 1925 he married the red-haired Sarah Theresa Freegrove in St Leonard’s church, Deal. His wife was known as Rose. Richard called the house in Middle Deal Road which he built for his family “Wi-Wurri”. He continued to drink. There is the story that he left the pub drunk one night and fell into the gutter. A man helped him up and asked him where he lived. ‘Wi-Wurri’, replied Richard. ‘No, we have to get you home. What’s your address?’ But all Richard could repeat was ‘Wi-Wurri’. Nell and Edie were working as hotel waitresses. It fell to the youngest, Jean, to keep house. Nell married Frank Vidler and went to live in St Leonards-on-Sea in Sussex. She remained childless. Jean fell in love with a Yorkshire miner, Ronald Nightingale, who worked in the local Betteshanger pit which ran under the Channel. Miners were looked down on in Deal and Richard would have nothing to do with Ron. Jean left home to marry him. Edie was now the only daughter left at home. As well as keeping house, she used to help her father by cleaning out the houses he built after they were decorated. 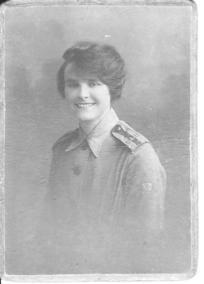 She had a long-term courtship with the Royal Marine bandsman, Edmar Sampson, who was supporting his widowed mother. They did not marry until Edmar was posted to Plymouth in 1930. Edmar said that they had a policeman stationed outside the church during the wedding, in case her father cut up rough at losing his last daughter. We find a last mention of Richard in the Dover Express of Fri 13 Mar 1931. He had applied to the Dover and Eastry Assessment Committee for a reduction in the rates on “Wi-Wurri”. His appeal was successful. R.W. Cory of “Wi-Wurri”, Middle Deal Road from £24 and £17 to £22.10s and £15. Also reduced by the same amount was “Desiree”, Middle Deal, owned by J.W. Cory. He has not yet been identified. £35. This was evidently a more expensive property. “Thandiani” was also the name of the house next door to “Wi-Wurri”, which was the home of Richard’s eldest daughter Jess and her husband, Richard’s former business partner, Edward Hopper. Their daughter Enid later used it for her own home in Exeter. Richard died on 12 January 1939. The death took place at his home in 212 Middle Deal Road. The cause was a cerebral haemorrhage. One of the possible reasons for this is excessive alcohol consumption. His occupation is given as “Bricklayer (Master)”. The death was registered by his son Herbert (Bert), then living at Erindale, the Grove, Deal.